Is Baseball White Public Space?? Is Baseball White Public Space? Over Friday and Saturday, August 24-25, the MSPS Martin Luther King, Jr. Series for the Study of Race kicks off with a 30-hour immersion program in Chicago where we will ask critical questions about race and major league baseball. Is baseball a public space? Who is it for? Who owns it? What is baseball’s division of labor like? How is baseball situated in the communities in which games are played? 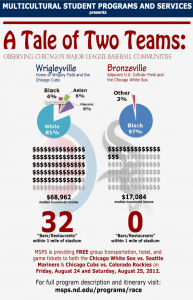 Chicago is a unique place to look critically at race and baseball because the city hosts two different major league baseball teams, each situated in two very different communities. The Chicago Cubs play their games on the north side of the city at Wrigley Field in a community that is predominantly white and higher on the socio-economic scale. 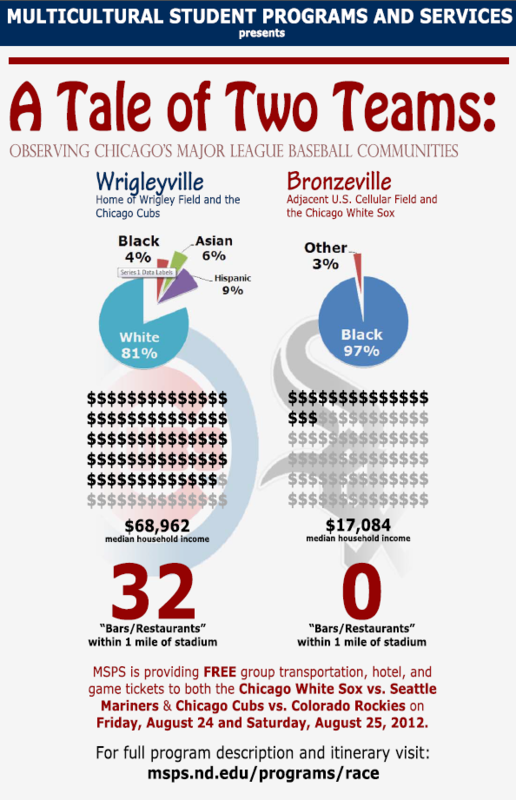 Conversely, The Chicago White Sox play their games on the south side of the city at U.S. Cellular Field adjacent a community that is overwhelmingly predominantly black and situated much, much lower on the economic spectrum. We will have a chance to walk around in each of these communities and get to chat a little bit with some of their members and visit some of their stores and restaurants. We will also get to attend a major league baseball game in each of these stadiums, where we will also be looking at how race and economics impact life and community during a typical, regular-season game. We will make some sharp comparisons between each of these two communities. We will also note how each baseball team, the Cubs and the White Sox, separates and/or integrates into the communities in which they play. It’s kind of like an ethnography project, if you’re familiar with the method. (Wikipedia it!). Everyone who participates will receive a small field journal to use for reflections, jotting down observations, interviews, etc. We will also have an opportunity to meet with some important people in these communities. The experience makes use of public transportation the entire trip. We will leave via the South Shore Line train from South Bend Regional Airport at 12:59pm on Friday, August 24th and use the CTA transit system while we are in Chicago. We will stay together overnight in the Chicago downtown “loop” area following the White Sox vs Seattle Mariners game on Friday night. We will head back to South Bend immediately following the Chicago Cubs vs Colorado Rockies game on Saturday afternoon. We will return to South Bend by about 8:00pm on Saturday night. We are attempting to keep this group very intimate to help with the accessibility of the program. So space is limited right now. If you are interested in coming along and thinking about these questions (and probably others) with us, please, please send me an email ASAP (tblake@nd.edu) so that I can hold your spot now. If you have any questions at all about this trip, please don’t hesitate to email me or find MSPS on Twitter and Facebook. Providing academic achievement, career placement, and leadership development programs and services for historically underrepresented students, and providing opportunities for all students to explore multicultural education, critical literacy, and identity development at the University of Notre Dame.